Bengal, in particular Hindus inhabiting it, have indeed got a “Poriborton” but not the coveted change as owing to the change of guard in the state Hindus have become the one and only casualty and with each day it passes, their position is getting perilous. Not the Hindus here are being snubbed only but their views and even legitimate protests are both being abused and subdued whenever necessary also. The murder of Rohul Kuddus, Moulavi on February 18, 2013 while returning from Jaamtala Haat, P.S. Kultali by gunmen (unidentified yet), has led to a series of Hindu persecutions in the vicinity and the silence of police and administration; their bids to smash Hindus also have added fuel to the fire. Jalaberia, located under the jurisdiction of P.S. Kultali, District: 24 Paraganas (South) has been the worst affected area. Hindus here are bearing the brunt of joint attacks of Muslim radicals and administration. 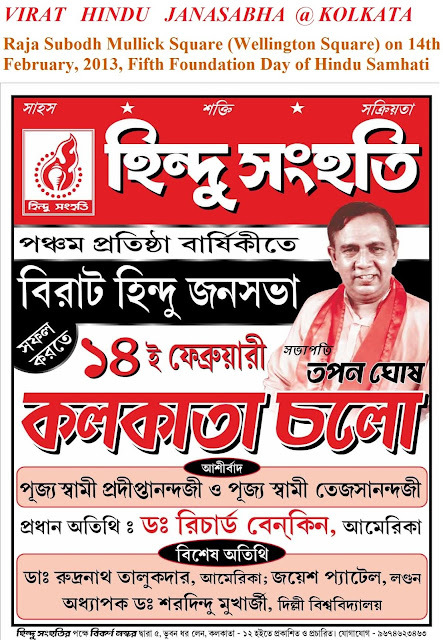 The gruesome episode or the anti-Hindu pogrom in Naliakhali and its vicinity may come as a rude shock to many but not Hindus, Bengali Hindus in particular, who have been victims of Islamic radicalism down the centuries. Even if there have been Hindu defences against these insensate bigots at times, those have either been sporadic or too minimal to contain the beast enabling Muslim radicals to flaunt their history of seven centuries at a stretch. What is this history of seven centuries? It’s Islamic subjugation of the Indian subcontinent or the Dark Age that witnessed an end to a period of enlightenment, rational thinking and prevalence of humanity or the supremacy of Vedic culture. What followed then is too known to people and a few anecdotes of those horrors are still available. A package of 1 dhoti, 1 saree, 1 ladies under garment, 1 mosquito net, 2 steel thali, 2 large size katora - provided to all 192 families. About total 40 Hindu Samhati workers participated. Among them from our central team were 9, 3 from other one NGO, rest were from other units near to Naliakhali. The whole operation was led by Sujit Maity and Bikarna Naskar. Among others were - Adv. Brojen Roy, Prasun Maitra, Riddhiman Banerjee, Arvind Mishra. Click here for Photos of atrocities and devastation in and around Canning. What has taken place in Naliakhali and 3 other villages yesterday (19 Feb) is virtually an anti-Hindu pogrom which fails to match the chronicle of Hindu persecution even. 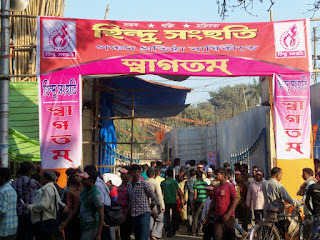 Hindu Samhati’s investigations at the helpless village on February 20, 2013 reveal that the entire event was not the result of any spontaneous onslaught by enraged Muslim radicals (following the murder of Moulavi Rohul Kuddus) but of a specific project contrived by brains hell-bent to exterminate Hindus racially in the very area. Some other disturbing and weird facts, as a result of investigations and talks with helpless Hindu villagers at Nailakhali, have come to the fore. It has been learnt, albeit violent Hindu persecution started at the wee hours on February 19 its extent was somewhat low till 8 am. The whole of Canning, at the moment, is under fire – the entire area is witnessing the worst Hindu persecution in recent times and as per fresh reports that are coming in, the saga of thrashing Hindus is extending far and wide, engulfing the adjoining areas of Joynagar, Kultali, Basanti and Sandeshkhali as well. It has come to knowledge, two Moulavis, Rohul Kuddus - resident of Ghutiyari Shariff and Abdul Wahab – resident of village: Moujpur, P.S. Joynagar – were returning from Jaamtala Haat, P.S. Kultali after attending an Islamic congregation there on February 18, 2013. While both were coming back late at night, they were attacked by unidentified culprits midway – Rohul Kuddus was murdered and Abdul Wahab was left injured. And to avenge the same, Muslims started attacking Hindus in the wee hours of today itself in and around the area of Herobhanga. No less than 25,000 Muslim radicals virtually pounced down on Hindus in the wildest manner. 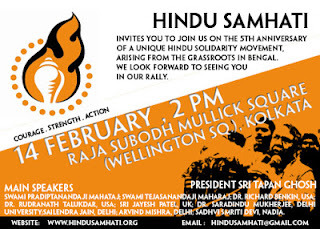 Hindu Samhati’s 5 th anniversary at Wellington Square on February 14, 2013, dashing the hopes of Muslim-appeasing state administration and aeonian foes of Dharma, has got a historic success making its antagonists grasp that a Hindu force to be reckoned with has appeared in Bengal at long last. The state administration, albeit benevolent enough to permit Muslim radicals to machinate conventions or stage protests whenever necessary, was hell-bent to foil this anniversary and hence, it left no stone unturned to dampen the spirit – as a result Hindu Samhati had to move to the corridors of judiciary and obtained the coveted permission to hold meeting from Hon’ble High Court, Kolkata. Little did the Bengal administration know that their entire approach stimulated Hindu Samhati only and the rest is history by now – virtually an epic struggle that will be written in golden words in history. POSTER FOR 14 FEB. EVENT IN KOLKATA. 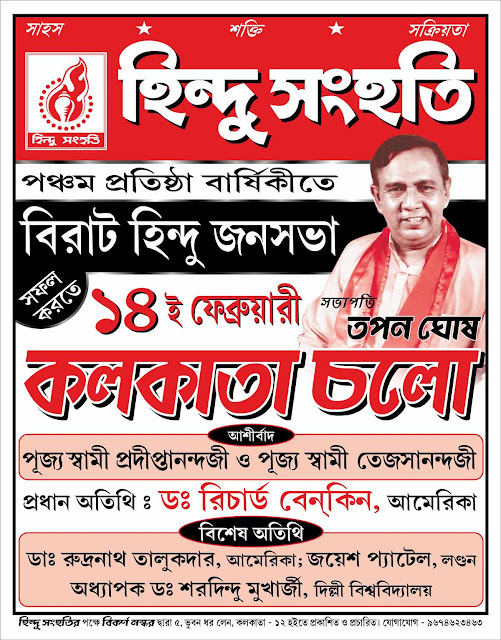 After overcoming multiple hardships that came in their way, the tireless activists of HINDU SAMHATI are finally ready to celebrate HINDU SAMHATI's fifth foundation day, on February 14, 2013. The Government of West Bengal tried its level best to prevent us from organising any public event in the heart of Kolkata. However, thanks to assistance from the Hon'ble Calcutta High Court, just as in 2012, this year also we have plans to arrange a mammoth gathering. Barasat is back in news once more and certainly for wrong reasons; the entire area has turned into a danger zone for Hindu women virtually and due to the perennial reluctance of local administration, Muslim hooligans and their accomplices are reigning there supremely. The situation is such that Hindu women can be abducted, molested and even raped at any moment. While a Hindu girl student was assaulted brutally on February 1, 2013, her family making desperate efforts to save her from Islamists was also thrashed severely. Once a Hindu festival is performed at any institution in contemporary Bengal it must be countered with doing a Muslim festival there – however insignificant it is – and all measures ranging from pressurizing to intimidating concerned authority with dire consequences, if there is any failure to perform, reign highly. Akuni Biji Beharilal Institution, adjoining Gaopalpur Bazar, close to Moshat in District: Hooghly, remains witness to such a horrendous development. In Rawalpindi, the temple located at GovernmentAsgharMallCollege is used as a scrap yard. A Shiva temple at Gunjmandi now houses storerooms or shops. 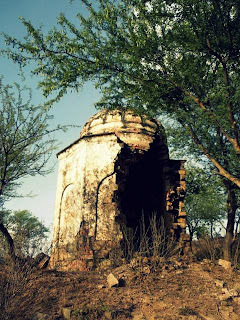 There are a few more abandoned temples scattered around College Road, Bohar Bazaar, Purana Qilla, Bagh Sardaraan and then some on the outskirts of Rawalpindi which are about to collapse, or so it seems! In the old area of Lunda Bazaar, there used to be three temples, a Gurdwara, a KhalsaSchool and many Havelis belonging to the Hindus and Sikhs of the time. Of the three temples, two have survived. The third, of goddess Kali in the main bazaar, no longer exists. It has been converted into living quarters and extensions have been made, thus changing the original structure entirely. 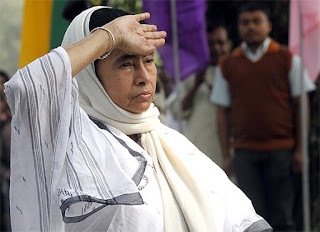 Rhetoric of Mamata Didi in accusing the central government of snubbing Bengal intentionally leading to an empty treasury or on how a cash-strapped government can cater people’s basic needs has become intolerable to a multitude of Bengal’s population, according to sources. They have been found to wonder the government’s intentions even! Are we in a civilized state? It’s official now – Bengal Chief Minister, Ms. Mamata Banerjee, was wholly instrumental to block the visit of Salman Rushdie, internationally acclaimed author, to Kolkata and she acted thus on the dictation rather than advice of an Islamic cleric, Maulana Barkati, Imam of the Tipu Sultan Mosque. And this has been claimed by none except the Imam himself while there has not been any approach from the Bengal government or CM’s office yet to nullify it. On the word of Imam, "I spoke to Mamata Banerjee when she was in Darjeeling. Just one day before Salman was to come ...He was supposed to come in the morning. I got to know the night before. She said don't worry, I won't let him come. You don't worry. Ours is a secular state. It will remain secular. Mamata said he was ashaitan."